Home>News of Metal Industry > Is Manganese Important? Manganese is a metallic element that can be found on the periodic table and has the symbol Mn. It is hard and very brittle. In nature it can only be found in combinations with oxygen, carbon and silicon and also other elements to form minerals and mineraloids. It is the 12th most abundant element and makes up almost 0.1 percent of the Earth’s crust. Since 1860's, the use of manganese became irreplaceable for human society. Manganese is essential in the process of steel making. Although it is used in much smaller quantities than iron, it is of no lesser importance. Almost 90 percent of manganese consumption is accounted for by steel industry globally. Manganese removes the oxygen and sulfur from the iron ore, converting it into iron and improving its malleability, it then forms with iron an alloy known as steel. The amount of manganese used to make steel varies from 6 to 9 kilograms per tonne of steel. Manganese is also used as an alloy with copper and aluminum. Aluminum alloys with 0.8 to 1.5 percent of manganese are used for most beverage cans. 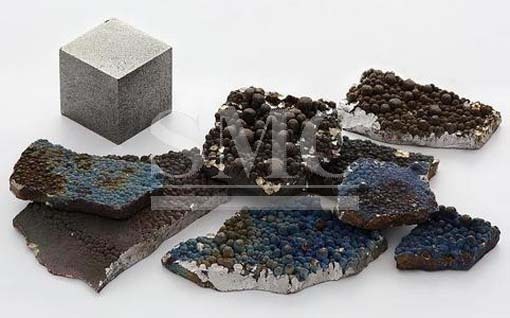 Important non-metallurgical uses include battery cathodes, micro-nutrients in fertilizers, water treatment chemicals, colorant for automobile undercoating, and tiles. The product “manganese violet” is used for the coloration of plastics, powder coatings, artist glazes, and cosmetics. Most of manganese ores are being mined only in a few places such as South Africa, Australia, China, Gabon, Brazil, and Ukraine. An importance source of manganese is also found in the ocean under the form of manganese nodules. Attempts have been made to mine manganese nodules from the seabed. Of economic importance, such nodules can be found especially in the Pacific and Indian Oceans at depths of 3500 to 6500 meters. These nodules often lie loosely on the bed floor and are sometimes covered by a layer of sediments which make them easy to be collected. Industrial mining of manganese nodules is not yet possible as market mining machines are still not available. It is also a question of how the sea floor and the environment will be affected.